Social media is a great way of getting your message across to a wider audience. Before the arrival of the internet, a growing anti-establishment protest or grassroots movement could be easily ignored by the liberal media. And if it became too popular, a comprehensive smear campaign would usually finish it off without any meaningful riposte from those on the receiving end. All that changed with the arrival of the internet, where websites could instantly reply to attacks from the media or even determine the narrative themselves on social media, particularly if they had a reasonably large following online. The social media companies, at the behest of the liberal establishment, running cared after a series of political setbacks (in the UK, Brexit is the prime example) are seeking to close down any narrative or movement that doesn’t chime with the multicultural;liberal globalist agenda. In the UK, the likes of Britain First (a BNP splinter group) and ‘Tommy Robinson’ (the former English Defence League leader) have been kicked off various social media platforms because of their opposition to mass immigration, multiculturalism and militant Islam. Even the likes of the Traditional Britain Group, which isn’t a street-based movement, has faced major problems keeping its accounts going, thanks to recent crackdowns. Seemingly, Generation Identity, an ethno-nationalist youth movement with activists across Europe, particularly in France and Austria, is now under attack. Last year, Generation identity UK was banned from Facebook. 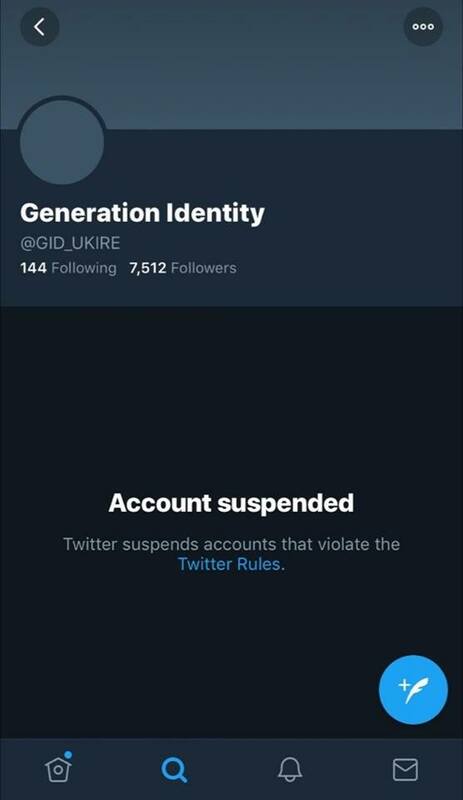 Today, they announced that a number of the group’s Twitter accounts have also been banned. Who’s next in the ‘Great Censorship’?